Can you believe that Easter is less than two weeks away? I swear, it feels like I’m still digesting Thanksgiving dinner. I must be getting old. Needless to say, Erica, Karen and I had to celebrate . . . you know how we do it! Two words: Easter brunch. We got you covered. 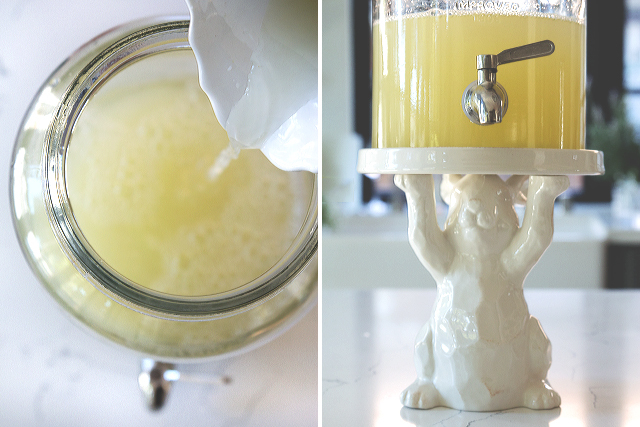 This year, rather than getting all punch-happy I decided to keep it simple but fun with this DIY lemonade bar. 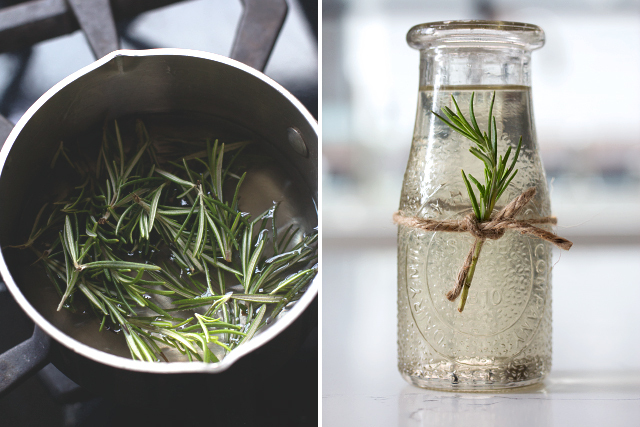 I gathered up a bunch of my favorite herbs and made simple syrups. 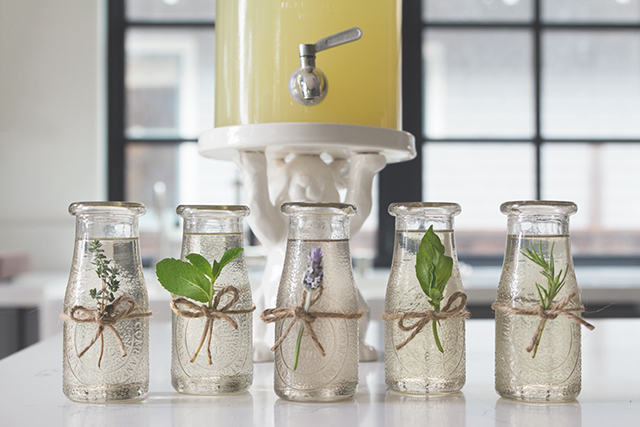 We tied fresh herbs around the corresponding syrups for identification. Then, I displayed each syrup next to a big batch of unsweetened lemonade so that guests are able to customize their own flavor and sweeten to taste. Be sure to check back for more from our Easter brunch, as we share our modern takes on classic Easter recipes. In the meantime, you can head over to Pottery Barn for a sneak peak, as well other entertaining tips. Add 1 cup water and 1 cup sugar to a medium sauce pan over medium-low heat and stir until the sugar completely dissolves. 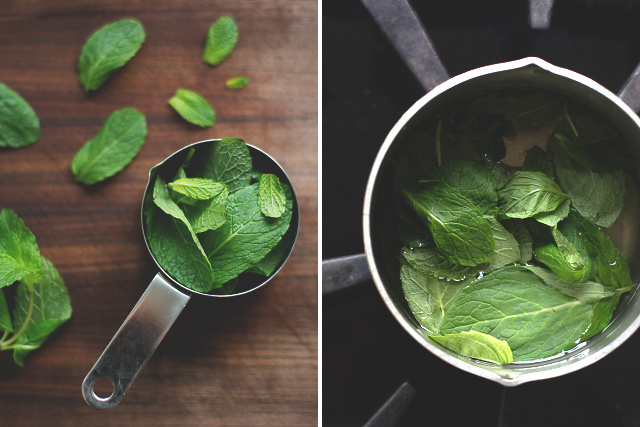 Once the sugar has dissolved, turn off the heat and add the fresh mint. Stir until all the leaves are coated in syrup and let steep for 15 minutes. 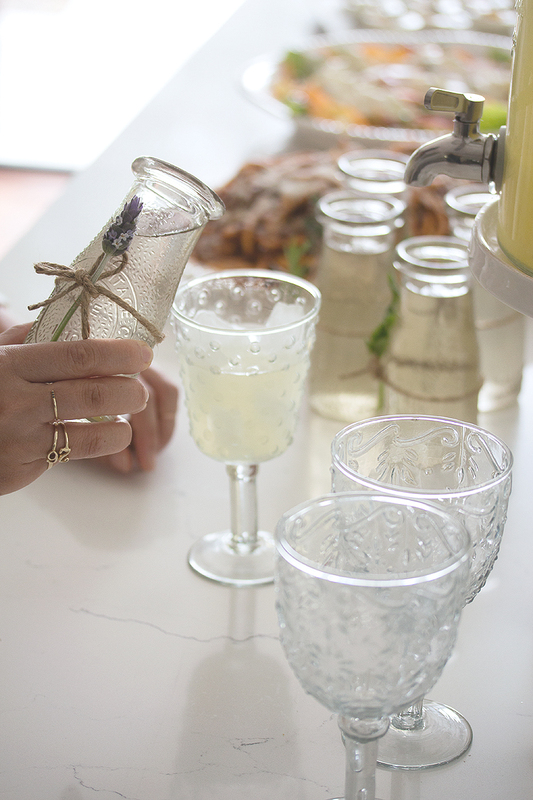 Strain into a glass jar and let cool before serving. Store in the fridge for up to two weeks. 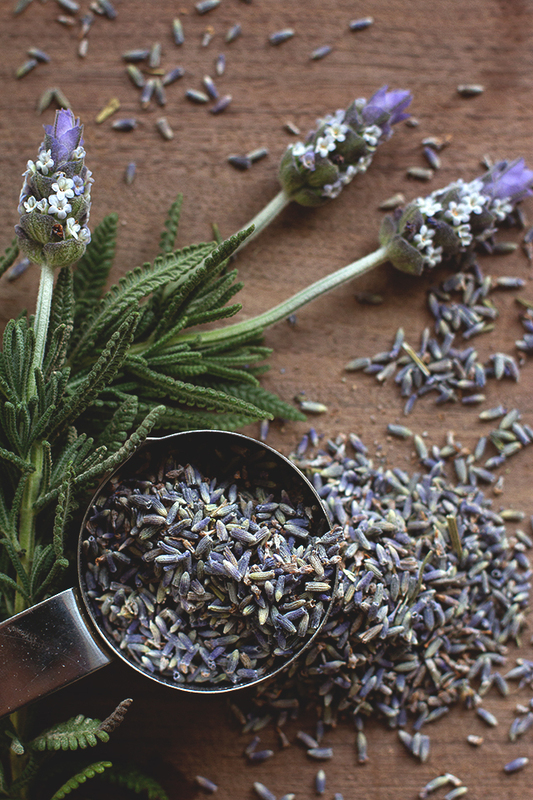 Once the sugar has dissolved, turn off the heat and add the dried lavender. Stir until all the buds are coated in syrup and let steep for 15 minutes. 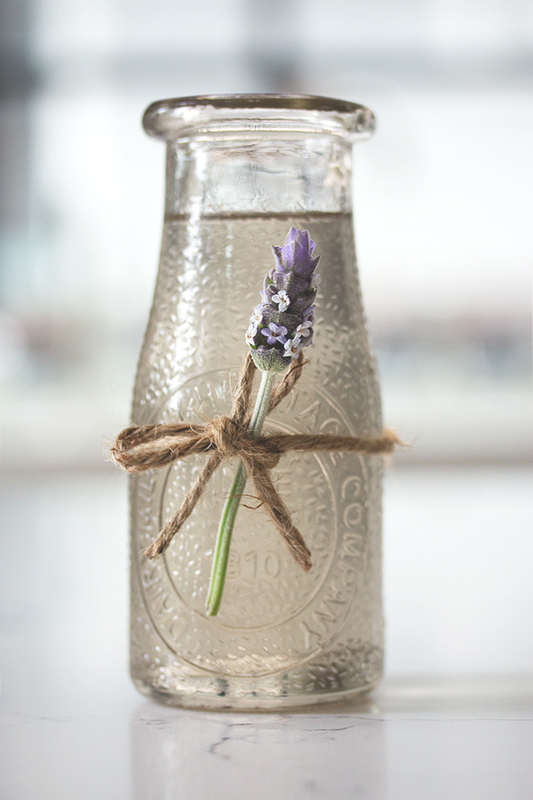 Strain into a glass jar and let cool before serving. Store in the fridge for up to two weeks. Add 1 cup water and 1 cup sugar to a medium sauce pan over medium-low heat and stir until the sugar completely dissolves. 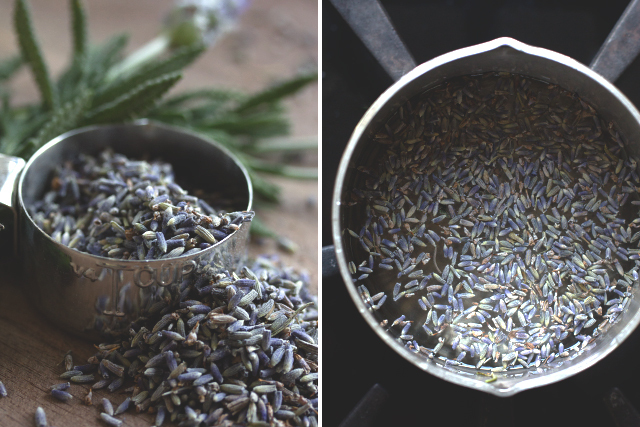 Once the sugar has dissolved, turn off the heat and add the fresh rosemary. Stir until all the leaves are coated in syrup and let steep for 15 minutes. Strain into a glass jar and let cool before serving. Store in the fridge for up to two weeks. 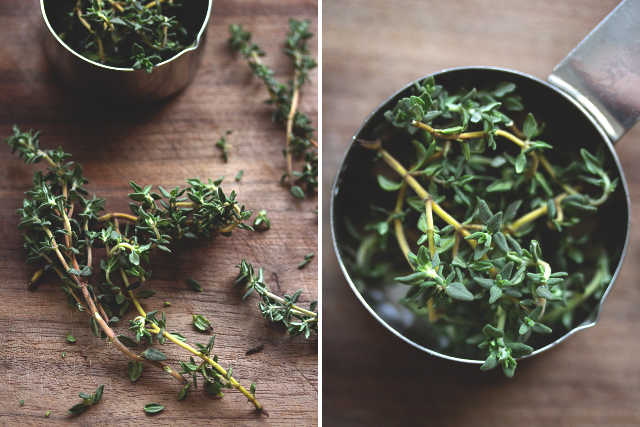 Once the sugar has dissolved, turn off the heat and add the fresh thyme. Stir until all the sprigs are coated in syrup and let steep for 15 minutes. Strain into a glass jar and let cool before serving. Store in the fridge for up to two weeks. Add 1 cup water and 1 cup sugar to a medium sauce pan over medium-low heat and stir until the sugar completely dissolves. Once the sugar has dissolved, turn off the heat and add the fresh basil. Stir until all the leaves are coated in syrup and let steep for 15 minutes. 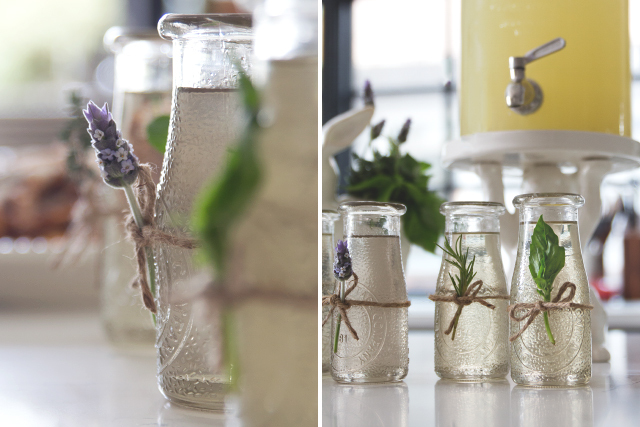 Strain into a glass jar and let cool before serving. Store in the fridge for up to two weeks. Just before your guests arrive, add the freshly squeezed lemon juice and sparkling water to your beverage dispenser and stir to combine. 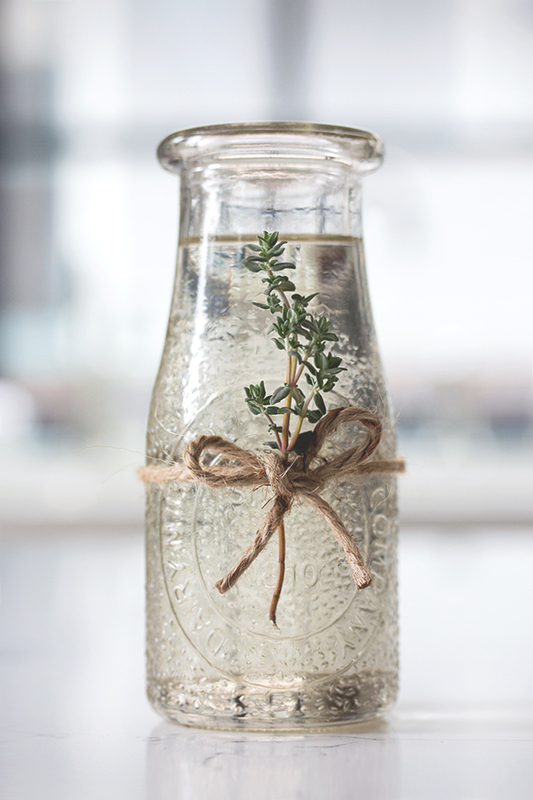 Remove your herbal syrups from the refrigerator and display next to the beverage dispenser. 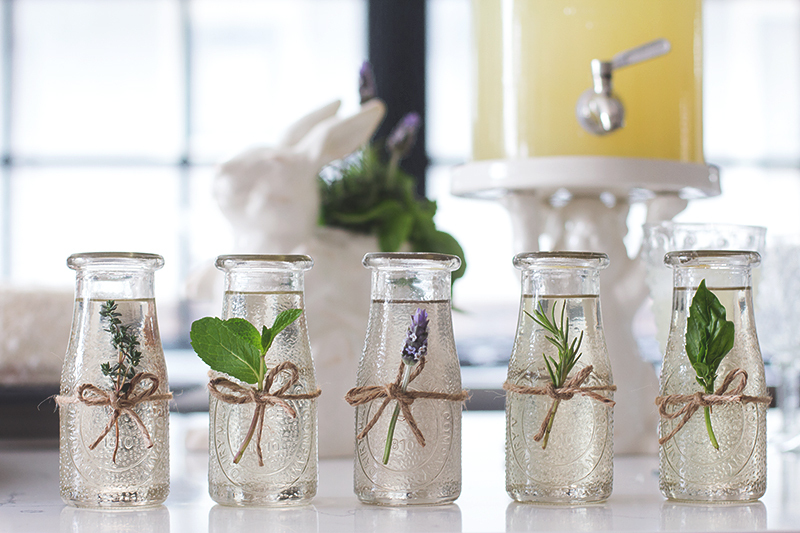 Tie each herb around its corresponding jar with a piece of twine so your guests can identify which syrup is which. And you’re ready to serve! Fill your glass with ice and add the lemon-sparkling water mixture. Make sure to save some room for syrup. 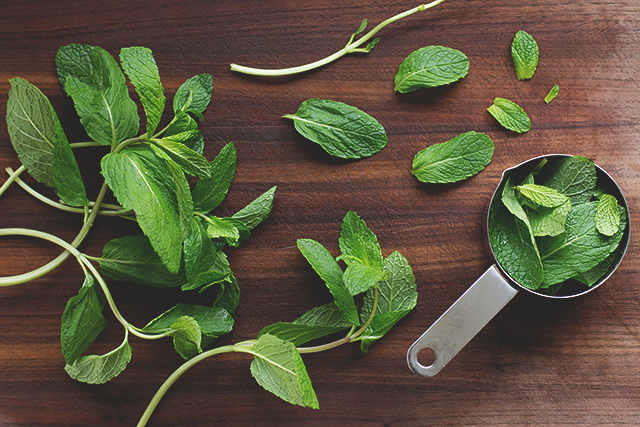 Sweeten to taste with the syrup of your choice, and garnish with a sprig of fresh herb. Can you tell us where you got the beverage stand? Soooo blasted cute! This is beautiful!! Absolutely love it! Where are the jars holding the syrups from? This is great! I already love to do things like this but this is far prettier. I have never seen anything displayed on the outside of the glass too, especially pretty flowers to match the inside. Beautiful darling! This is right up my alley! 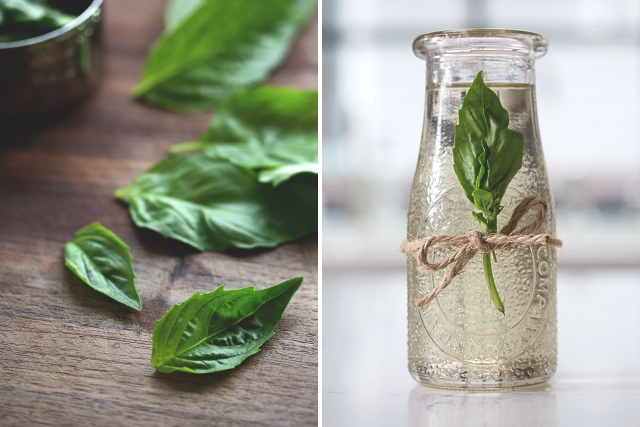 I adore using herbs in simple syrups and I’m not absolutely obsessed with this idea. What a beautiful way to add a touch of elegance to brunch. Love! Thank you Rachael!! Herbs are the freeeeekin best! They’re inexpensive, and add instant charm. I love this! It’s so supremely cute! yea I gotta echo Gaby … I want them ALL! 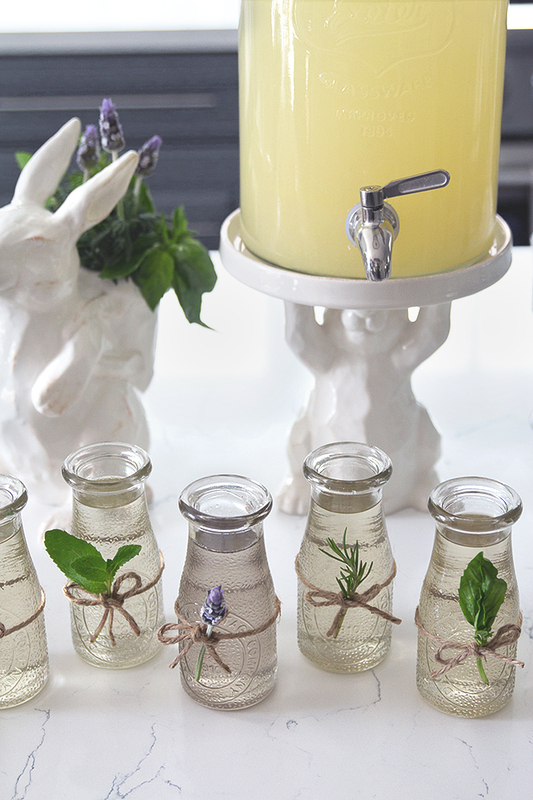 Such a fabulous idea for spring! I want them all! Aw, thanks so much Sophia. Did you give a try? What a great idea! 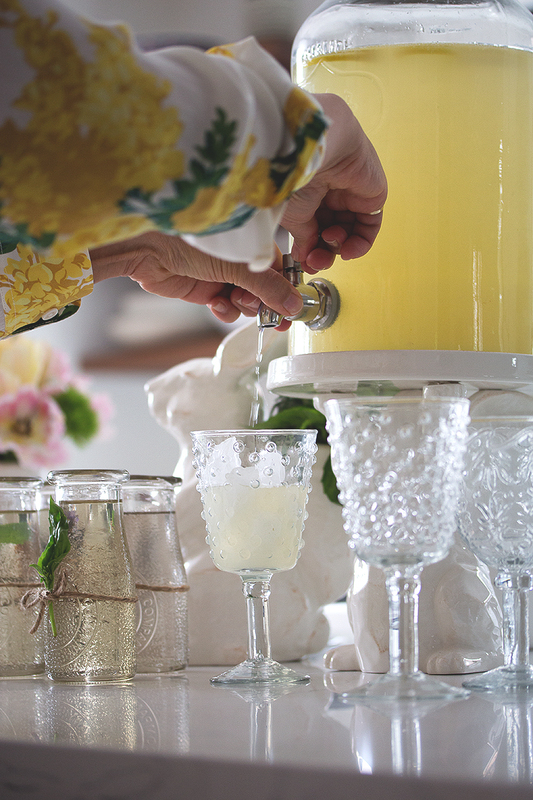 And those lemonade glasses… yes, please! Fabulous! Any ideas for other uses of an herbal simple syrup bar? Thanks Amelia. Definitely great in cocktails — switching out a standard simple syrup for an herbal variety!